Purpose: To compare the clinical outcome of single implants which underwent immediate nonocclusal loading with implants subjected to early non-occlusal loading at 3 weeks, and implants conventionally loaded at 4 months. Materials and methods: One hundred and five patients in five private practices requiring a single implant-supported crown were randomised to immediate loading (35 patients), early loading (35 patients) and conventional loading (35 patients) groups. To be immediately or early loaded, implants had to be inserted with a torque superior to 45 Ncm. Immediately and early loaded implants received non-occluding temporary crows, whereas conventionally loaded implants were directly restored with definitive crowns. Temporary crowns were replaced by definitive ones after 4 months. Outcome measures were crown and implant failures, complications and peri-implant marginal bone level changes recorded by a blinded assessor. Results: Two patients dropped out from the immediate loading group up to 1-year post-loading. Two implants failed, one in the immediately loaded and one in the early loaded group (P = 0.601). One immediately loaded implant and two early loaded implants were affected by one complication each (P = 0.162). Mean peri-implant marginal bone loss after 1 year was -0.120 ± 0.230 mm (95% CI -0.35, 0.10) for immediate, -0.390 ± 0.840 mm (95% CI -1.23, 0.45) for early and -0.201 ± 0.306 mm (95% CI -0.51; 0.11) for conventionally loaded implants. There were no statistically significant differences for any of the outcome measures between the three loading strategies up to 1-year post-loading. Conclusions: No major clinical differences were observed with regard to implant survival, complications and marginal bone level changes when loading single implants immediately, early or conventionally. Purpose: To evaluate the influence of at least three abutment changes against the placement of a definitive abutment, which was no longer removed, on hard and soft tissue changes, and to compare the clinical outcomes of immediate non-occlusal loading versus conventional loading. 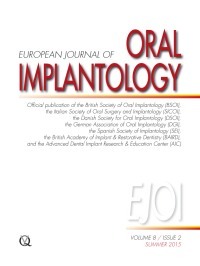 Materials and methods: Eighty patients requiring one single crown or one fixed partial prosthesis supported by a maximum of three implants were randomised, after implants were placed with more than 35 Ncm, according to a parallel group design to receive definitive abutments which were loaded immediately (definitive abutment or immediate loading group) or transmucosal abutments which experienced delayed loading after 3 months and were removed at least three times: 1) during the making of the impression (3 months after implant placement); 2) when checking the zirconium core of titanium abutments at single crowns or the fitting of the metal structure at prostheses supported by multiple implants; 3) at delivery of the definitive prostheses (repeated disconnection or conventional loading group). Patients were treated in four centres and each patient contributed to the study with only one prosthesis followed for 4 months after initial loading. Outcome measures were: prosthesis/implant failures, any complication, peri-implant marginal bone level changes, and patient satisfaction. Results: Forty patients were randomly allocated to each group according to a parallel group design. No patient dropped-out and no implants failed. However four provisional prostheses and one definitive prosthesis had to be remade because of misfitting (five single crowns) in the repeated disconnection group; and one provisional prosthesis had to be remade because of frequent debondings in the immediate loading group (difference = 10%; 95% CI: -1%, 21%; P = 0.109). Five complications (all debondings of the provisional prostheses) were reported in two patients of the immediate loading group, in comparison to three biological complications in three patients of the repeated disconnection group (difference = 2%; 95% CI: -8%, 13%; P = 1). All patients were very satisfied or satisfied with the function and aesthetics of the prostheses, and would undergo the same procedure again. Mean peri-implant marginal bone loss 4 months after loading was -0.08 (0.16) mm for the definitive abutment group and -0.09 (0.20) mm for the repeated abutment changes group (difference = 0.01; 95% CI: -0.07, 0.09; P = 0.97). There were no statistically significant differences for any of the outcome measures between the two procedures up to 4 months after initial loading. Conclusions: Preliminary short-term data (4-month post-loading) showed that repeated abutment changes do not alter bone levels significantly. Immediate non-occlusal loading of dental implants are a viable alternative to conventional loading. Therefore clinicians can use the procedure they find more convenient for their specific patient. Purpose: To evaluate the difference between a single preoperative dose versus an additional two-day postoperative course of oral amoxicillin in patients undergoing conventional dental implant placement. Materials and methods: Two dentists in two different private practices conducted this study. One hour prior to surgery, patients had to take a single prophylactic antibiotic dose, consisting of 2 g of amoxicillin orally; after implant placement, patients were randomly allocated to two different groups: protocol A (no other antibiotic administration) and protocol B, (1 g of amoxicillin in the evening of the day of surgery and 1 g twice a day for the 2 days after). Outcome measures were prosthetic and implant failures, adverse events and early postoperative complications. Patients were followed up to 6 months after functional loading. Results: Three hundred and sixty patients were randomised and treated (192 patients in one centre and 168 in the other). Five hundred and sixty-seven implants were placed. Protocol A was applied to 180 patients (278 implants) and protocol B also to 180 patients (289 implants). Data for 17 patients, 14 from protocol A and three from protocol B, were not available. No statistically significant differences were found for the reported outcomes. Two patients of protocol B experienced a prosthetic failure, losing four implants, while no prosthetic failures were reported for protocol A (P = 0.4836; difference in proportions = -0.0110; 95% CI: -0.0412 to 0.0119). Five patients (3.0%) of protocol A lost five implants versus 5 patients (2.8%) who lost eight implants in protocol B (P = 1.0000; difference in proportions = 0.0020; 95% CI: -0.0384 to 0.0438). Three adverse events were observed in the total population, all occurring in protocol B (1.69%), with no statistically significant differences between the two groups (P = 0.1199; difference in proportions = -0.0170; 95% CI: -0.0487 to 0.0059). However, one patient experienced a severe allergic reaction requiring therapy discontinuation and hospital admission. Early postoperative complications occurred in six patients of protocol A and in four patients of protocol B, with no statistically significant differences (P = 0.5170; difference in proportions = 0.0130; 95% CI: -0.0254 to 0.0568). Conclusions: No statistically significant differences were observed between 2 g of preoperative amoxicillin and an additional 2-day postoperative course, although adverse events were reported only in the additional 2-day postoperative group. Based on these findings, it might be sufficient to routinely administer preoperatively 2 g of amoxicillin to patients undergoing routine dental implant placement procedures rather than administering additional postoperative doses. Purpose: To investigate expression of gene markers for the plasminogen system, inflammation, and bone resorption/remodelling in peri-implant crevicular fluid samples from healthy subjects, subjects with mucositis and subjects with peri-implantitis. A possible inhibitory effect of suppuration on the analysis of gene expression in samples from subjects with peri-implantitis was also analysed. Materials and methods: Peri-implant crevicular fluid (PICF) was sampled from 25 healthy subjects (H), 25 subjects with mucositis (M) and 25 subjects with peri-implantitis (P) using paper points and suction tips. The samples were analysed by quantitative polymerase chain reaction (qPCR). The following biomarkers associated with the plasminogen system, inflammation and bone resorption/ remodelling were investigated: interleukin-1 beta (IL-1β), interleukin 8 (IL-8), tissue plasminogen activator (tPA), plasminogen activator inhibitor 2 (PAI-2), tartrate-resistant acid phosphatase (TRAP) and cathepsin K (CatK). Results: IL-1β and IL-8 were significantly upregulated in the P group, and tPA and PAI-2 were significantly upregulated in the M group. These four genetic markers were oppositely regulated in samples from the subjects in the mucositis compared with the peri-implantitis group. TRAP and CatK showed no differences between the groups. The presence of suppuration did not have a detectable effect on gene analysis in samples from subjects with peri-implantitis. Conclusions: Markers for the plasminogen system and inflammation could be used to distinguish between mucositis and peri-implantitis. The results suggested that the plasminogen system was sufficiently upregulated allowing for resolution of inflammation and healing at the inflamed implant site in subjects with mucositis, whereas such upregulation was insufficient resulting in impaired healing and prolonged inflammation in subjects with peri-implantitis. The combination of tissue inflammation and low levels of tPA was a strong predictor of marginal bone loss in this study. It may be an interesting candidate for the unambiguous diagnosis of mucositis and peri-implantitis independent of radiographs and could possibly constitute a powerful future tool for rapid assessment of the periimplant tissue condition and the effect of subject treatment. Purpose: To evaluate the clinical outcome of maxillary prostheses supported by four immediately loaded zygomatic implants in the rehabilitation of edentulous patients with severe atrophic maxillae after 5 years of function. Materials and methods: Out of a total of 17 consecutive patients with severe atrophy in the maxillae (Cawood and Howell classification C-VI and D-V or D-VI) and whom were rehabilitated using four immediately loaded zygomatic implants, three were lost during follow-up. Outcome measures were success rates of the prostheses, success rates of the zygomatic implants, complications and oral health-related quality of life (OHIP-14 questionnaire). Results: In 14 patients assessed at 5 years after operation, no prosthesis or zygomatic implants failed, although one implant placed in an unfavourable position was not used. Fifty percent of the patients had complications, which included penetration of the orbital cavity during the drilling procedure (1 patient), infection followed by a fistula at one zygomatic implant (1 patient), sinusitis (2 patients), fracture of the abutment screw (1 patient) and fracture of the prostheses (2 patients). All complications were resolved without clinical consequences. At 5 years the mean score of the OHIP-14 was 3.8, which is similar to that of the general population. Conclusion: Results at 5 years indicate that the use of four immediately loaded zygomatic implants is a reliable approach for successful rehabilitation of edentulous patients with severely atrophied maxillae. Purpose: To present a case of Herpes Zoster Ophtalmicus (HZO), which was reactivated postoperatively after a sinus lift operation. Materials and methods: A 39-year-old male was referred to our clinic for implant-supported dental rehabilitation. He had maxillary missing teeth in positions 13, 14, 15 and 16 and a pneumatised right maxillary sinus with a bone height of 2 mm. Lateral sinus lifting and bone block grafting was performed before implant insertion. Twelve days after the sinus lift, the patient complained of pain and itching at the infraorbital area extending to the forehead. Clinical examination revealed no signs of infection or allergy. The patient received consultation from a dermatologist in order to rule out a possible dermatological disorder. Finally he was diagnosed with HZO. Results: HZO was managed with systemic acyclovir treatment. Vesicular rashes and ptosis was seen 3 days after the medical treatment. After 1 month no postoperative skin or orbital sequela was seen. Three implants were inserted at the right posterior maxilla 5 months after sinus lift. One-year followup was uneventful. Conclusions: Dermatological diseases should always be kept in mind during the differential diagnosis of orofacial pain. In this case the proximity of the operation site and affected area gave rise to the idea that surgical trauma had a possible role in the reactivation of the virus. However, the process of reactivation is not entirely understood and requires further investigations. Early diagnosis is essential for HZO in order to avoid debilitating complications such as postherpetic neuralgia and blindness. Purpose: To describe the management of a patient with an initially unnoticed dislocated dental bur in the maxillary sinus that became symptomatic during a magnetic resonance imaging (MRI) scan. Materials and methods: A MRI scan provoked strong midfacial pain in a 31-year-old male patient, who exhibited ambiguous neurologic impairment consistent with multiple sclerosis. Conventional radiography revealed an opaque foreign body in close proximity to the orbital floor that most likely caused the painful symptoms during the MRI. Results: After additional X-ray computed tomography (X-ray CT) scans were performed, a metal dental bur was removed by a combined transconjunctival and transnasal approach under perioperative antibiotic treatment. Conclusion: The disappearance of instruments during surgical procedures requires diligent investigation and immediate retrieval.